As the trial of Chicago Police Officer Jason Van Dyke for killing Laquan McDonald reaches closing arguments, the police department is adjusting and extending officers’ work hours to have more manpower on duty to handle any protests or unrest. CPD brass are insisting that they are ready for whatever happens—if anything. 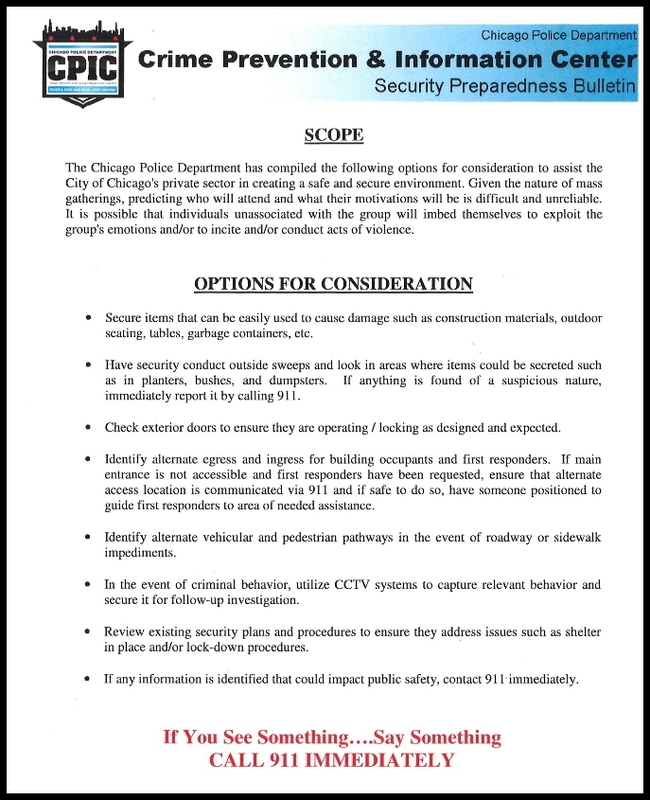 Downtown, the department’s Crime Prevention and Information Center recently provided many businesses and property managers with a page of “options for consideration” in the days ahead. The “options” include yawners like “utilize closed-circuit TV systems to capture relevant behavior” and “call 911 immediately” if public safety is threatened. • Find alternate routes for getting where you need to go "in the event roadway or sidewalk impediments” make your usual route more, uh, adventurous. For those not lucky enough to have received the department’s full list of considerations, we've included a copy here.